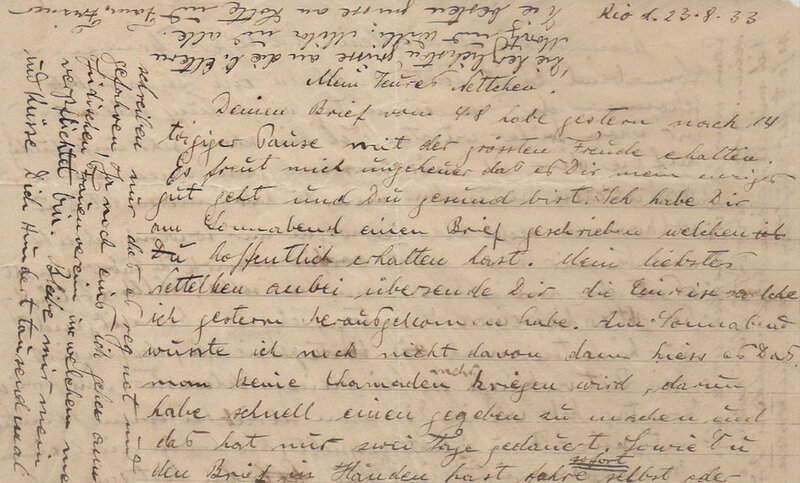 80 years after they were handwritten, in German, Moses' voice emerges, clear and expressive, thru a set of original letters. It is this voice that urges us to rebuild the universe around it, that comes back to tell us the story. It is clear to us that the man who wrote the letters was transpicuous. He reveals no concern to hide his insecurity and even less to articulate any kind of loving games. Besides the words, his frailty and self-surrender are made visible thru the calligraphy. The use of paper to its maximum (and, as we learn reading the letters, also of the ink) is touching. There is also a peculiarity in his style that puts us in direct contact with his beloved Natalia: Moses proves to be sensitive and careful with her feelings and affairs and often poses her as the focal point of the missives. Click to download the complete set of original letters. Moses was the 8th sibling of Adela and Chaim Waldmann. They lived in Wielkie Oczy, a shtetl (small town, in iidish) in eastern Galicia, then a Austro-Hungarian province, now a Polish, very near Ukrainian border. The family was quite poor but the older brothers were studying and having opportunities somewhere else, in bigger cities. On November 23, 1933, during the Atlantic crossing to meet her boyfriend Martin, Natalia was "baptized" with the code name Hake, according to the custom of the time to submit to ritual everyone who crossed the equator for the first time . Honda succeeded, with this animation film in multi technical style, not only a beautiful graphic outcome but also convey a desired emotional mood. To see a large and prestigious multinational corporation using successfully this technique in the effort to enhance its image reinforces our perception that we are on the right track. Beautiful, isn't it? See also below also the film's making-of. In 1933 photography was an expensive activity, usualy reserved for special moments and the register of the loved ones. Probably that's why Moses Waldmann did not care to photograph his Atlantic crossing nor his first months in Brazil. Thousand Kisses will reconstruct the images of this story using mixed techniques of animation and collages with photographs, illustrations and stock footage. Throughout the research for aesthetic and animation benchmarks, we found a short animation film which we fell in love for, both for it's brilliant text and it's amazing look. We hope to reach a final aesthetic result that will honor this reference: "The Thomas Beale Cipher", by Andrew S Allen. This film actually was my first inspiration. The author, Ransom Riggs did magic with a great copy and a fabulous song. I saw it over and over again trying to drink some of his inspiration.